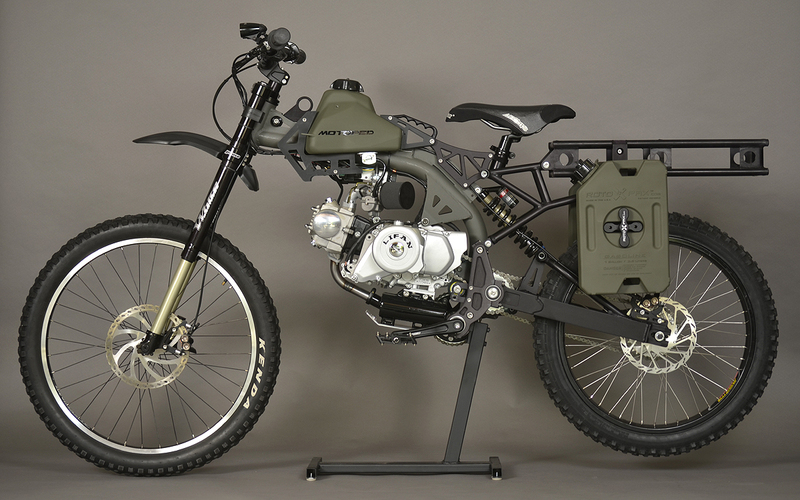 Part extreme dirt bike, part motocross racer, the original Motoped was one of my favorite discoveries of 2013. In 155cc form, the ultra-lightweight motoped could break every speed law in the book, and its narrow form, upright seating position, and excellent brake/suspension bits conspired to make it one of the best urban road missiles money could buy. Now, however, Motoped is going off road. Like, way off road. “Where we’re going, we don’t need. Roads.” off road. 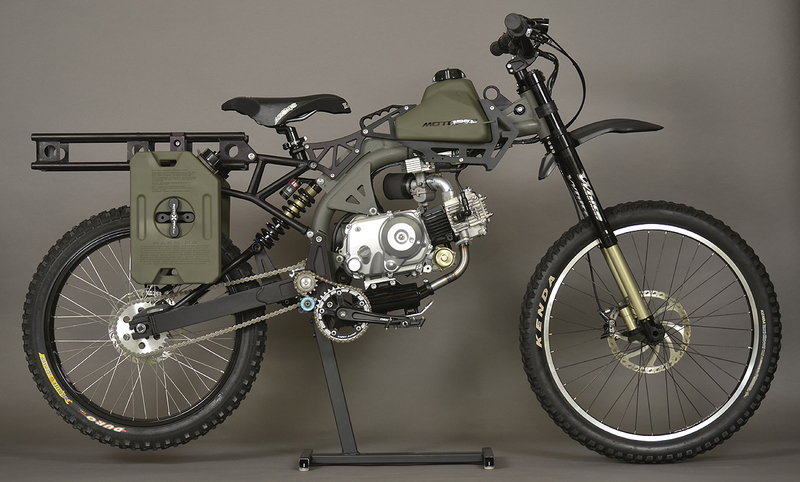 Meet the Motoped survival bike. 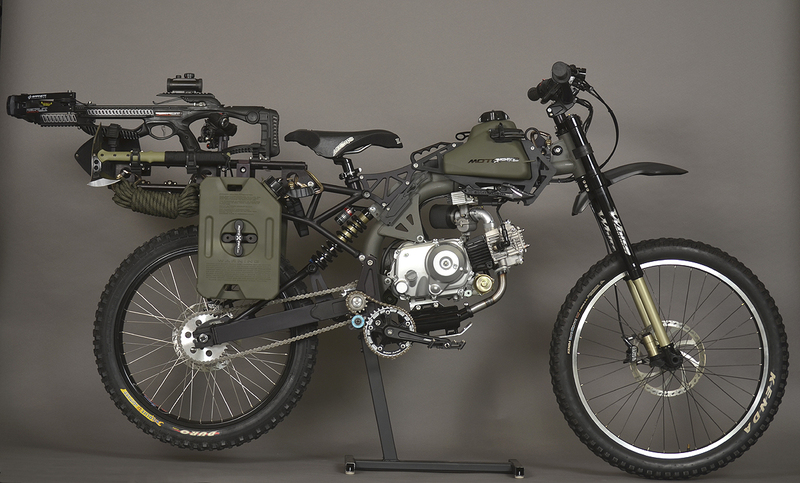 Like the Cogburn CB4 hunting bike we talked about a while back, this bike promises to take you and your gear way out into the woods with silent, zero-emission pedal power. 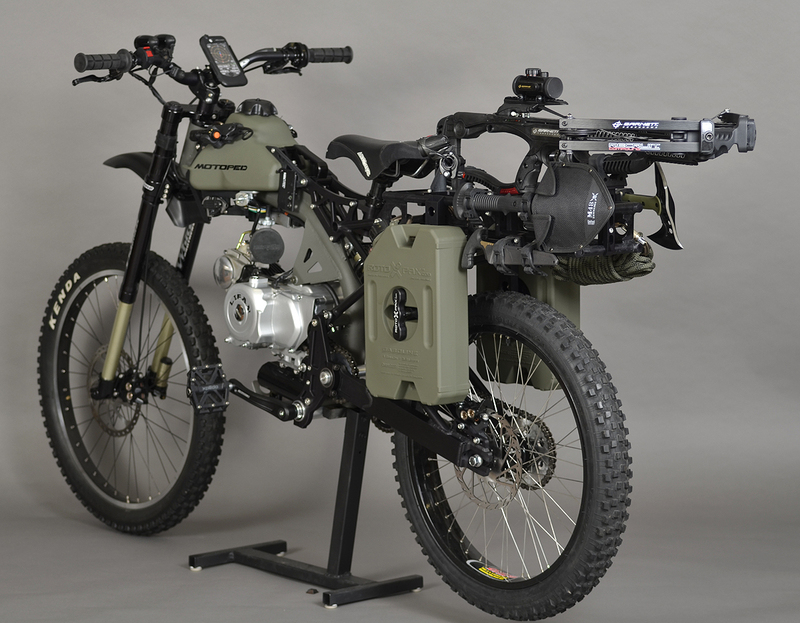 Where the Motoped is different, however, is that it has a motor- so you’ll be able to drag back that dear/pig/turkey you shot without excessively taxing your muscles. Granted, that gasoline engine won’t do you much good if there’s a real apocalypse (gas goes bad after a few months), but with nearly 100 MPG fuel economy on offer, it’s not like you’ll burn up what little gas you may have too quickly, you know? In any event, what you’re buying when you pick up a Motoped is actually a kit. 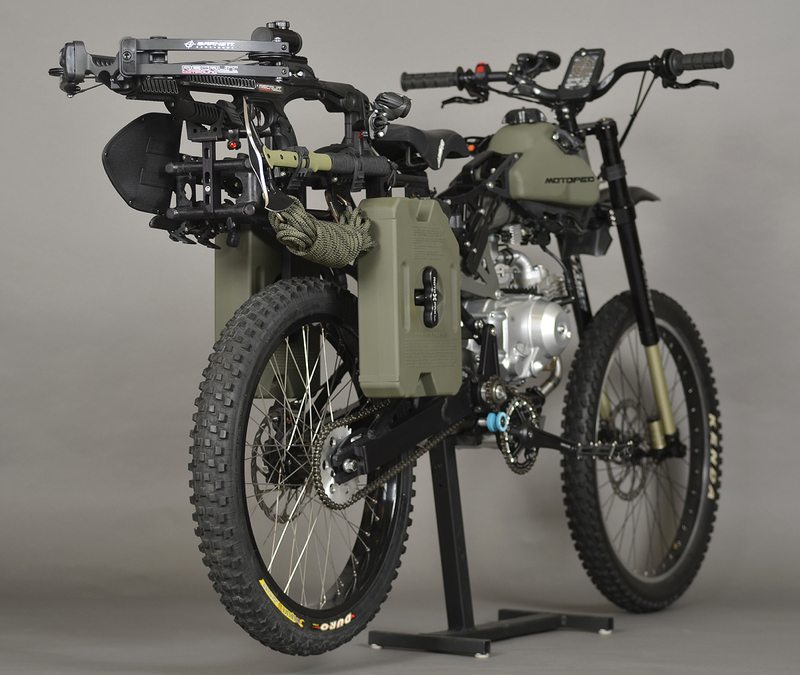 It’s a frame, in other words, with all the difficult engineering like mounting points, swingarm, and the Motoped’s patented pedal-drive system already in place. From there, you can build the bike you see here using the bodywork, seat, and engine/transmission from a Honda XR50 mated to high-end dirtbike components, or you can go completely psycho and build your own Motoped from the company’s ever-expanding list of parts and accessories. 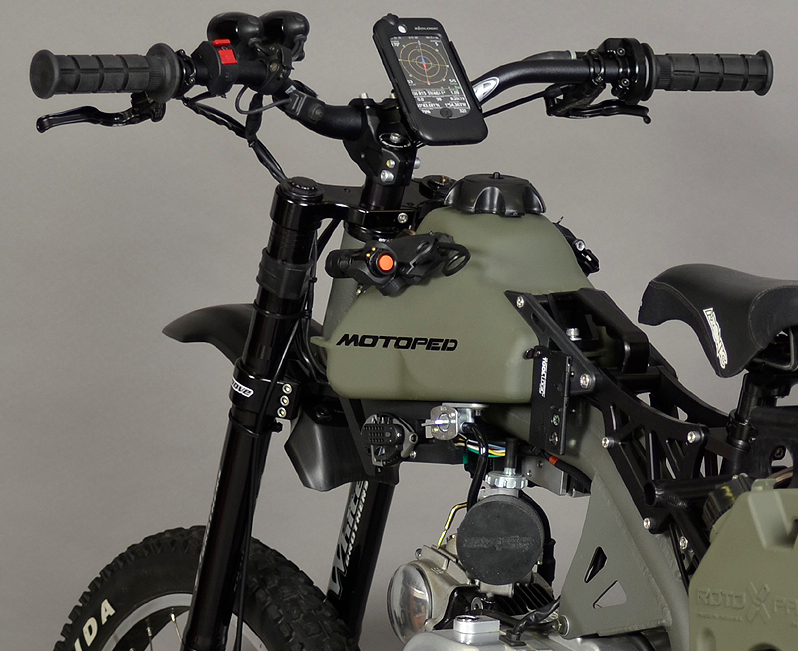 So, check out the photos of Motoped’s off-road adventure/survival moped, below, then let us know how you’d spec yours for ultimate survival in the comments section at the bottom of the page. Enjoy! ← Paul Elio’s Trike Will Baby – Will That Make a Difference?